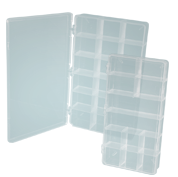 Explore our plastic utility boxes section and organize all your jewelry pieces or tools! These practical items are great for storage and they'll help you make some extra room in the back of the shop. Get the best discounts thanks to our wholesale deals!